Marie-Josephte Corriveau was a beautiful but ruthless woman. She married a good-looking man but soon grew bored with him. So late one evening, she stunned her husband with a blow to the head, then took a whip to his horse, which trampled him to death. The death was ruled an accident and La Corriveau was free to marry again. She was happy with her new love, at first. But her heart was fickle, and in time she cast her eyes on a handsome newcomer. So she took an axe to her second husband. But this time, she was caught in her deed and sentenced to death. La Corriveau was hung for her wicked deed, and her dead body was put in a cage and displayed prominently along the highly trafficked river road. Ah, but what the authorities did not guess, mon ami, was that the spirit of this evil woman would not die as it should. No. It was tied to her shackled, withering flesh. At night, La Corriveau’s eyes would open of their own accord and her decaying hands would reach toward passing travelers as she whispered the travelers’ names through a tangle of stringy locks. Soon, no one would use the river road after dark, so the authorities took the corpse and buried it deep beneath the ground, hoping to silence the evil creature. But their hopes were in vain; for many a night La Corriveau would arise from her grave and walk back and forth along the river road, accosting travelers. One night, a prominent citizen named Dubé was walking home to his new bride. As he passed the place where the cage of La Corriveau once stood, his eye was caught by a scene of wild, demonic figures dancing around the blue light across the river. “Madre de Dios,” he gasped in fear—and then he screamed as a pair of bony, withered hands clutched his throat from behind. Fear leant Dubé a strength he did not normally possess. He dropped to his knees, ripping at the creature’s hands and flinching as he felt dry flesh tearing away from La Corriveau’s bones. “In the name of the blessed Saint Anne, leave me,” Dubé shrieked as the wicked thing bent over him. Then he fainted and knew no more until the morning, when his frantic wife found him by the roadside and woke him with her sobs. The story of Dubé’s attack spread through the city, and finally the authorities were forced to call in the holy Curés to exorcise the foul spirit and free the citizens from her evil spells. 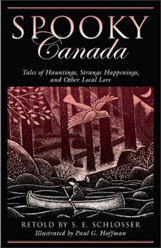 Read more ghost stories in Spooky Canada by S.E. Schlosser. the story look like a fiction because it doesn't really have an ending. SO FREAKIN SCARY IF I WAS DUBE I WOULD TOTALLY SCREAM IN FEAR! it was good. she's CRAZY!! this reminds me of another story i heard. so this lady confessed after she brought the axe on her 2nd husband? a little crazy, but good for a social studies prodject.